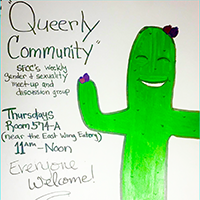 Queerly Community is SFCC’s new weekly gender & sexuality meet-up and discussion group. The group meets from 11 a.m. to noon on Thursdays beginning on Jan. 24 in Room 574-A (with the exception of Feb. 7 when the group will meet in the East Wing Eatery). Come kick it and get to know and build community! All are welcome.